Similar to Paxillus involutus, P. vernalis and P. obscurisporus, not yet known enough and distinguished on the account of the olivaceous brown spore print, pileipellis hyphae up to 8 μm broad, and especially due to the rhizomorphs with large crystals (up to 2.5 μm). Habitat. Under planted trees in parks and gardens. Mycorrhizal with lime (Tilia), poplars (Populus) or hornbeam (Carpinus). Distribution. Not yet understood. Probably not uncommon, but mixed with the other species of the Paxillus involutus complex. Hahn, C. & Agerer, R. 1999. 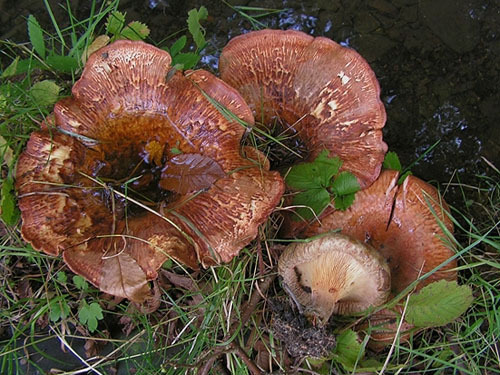 Studien zum Paxillus involutus Formenkreis. – Nova Hedwigia 69: 241–310.